On Oct. 29, 2008, Army Sergeant Christopher Gomes, a heavy equipment operator with the 54th Engineer Battalion, was convoying back to his base in southern Baghdad, Iraq, when his vehicle was struck with four explosively formed projectiles (EFPs). The blast resulted in the loss of his right leg and severe damage to the left. Before arriving at Walter Reed Medical Center, SGT Gomes was treated in Baghdad Combat Support Hospital and Landstuhl, Germany. He endured ten surgeries as an inpatient at Walter Reed and, a month after his arrival, began outpatient therapy until June 2009. Since then, he has undergone several surgeries to repair extra bone growth. Now medically retired, Christopher is happy to be living in his home state of Massachusetts. He enjoys supporting his favorite sports teams – the New England Patriots, Boston Bruins and the Red Sox – and working on carpentry projects. 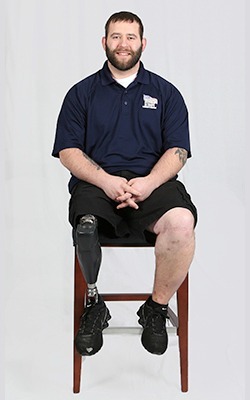 He is also an advocate for fellow Veterans within his community. He would like to finish his degree in counter terrorism studies, and says his mortgage-free home will help him financially with that goal. The open floor plan also helps him in his daily life. In his previous home, he would often fall while trying to do laundry going up and down the stairs. He also had trouble getting to his son’s room on the second floor when he was not wearing his prosthetic. Since receiving his home, Christopher has expanded his family and he now has a young daughter, who was born in 2018. His HFOT home allows him to care for both his children without limitations.